List of plants: Callitriche palustris, Fontinalis sp. Description of decorations: The sand is light beige, dark gray granite stones, structural background looking like stone outside the aquarium. Description of equipment: Atman A1 201 filter, AquaEl LEDDY TUBE SUNNY 6W. Water parameters: The temperature is 22°C, KH is 4, GH is 6, pH is 6.7. 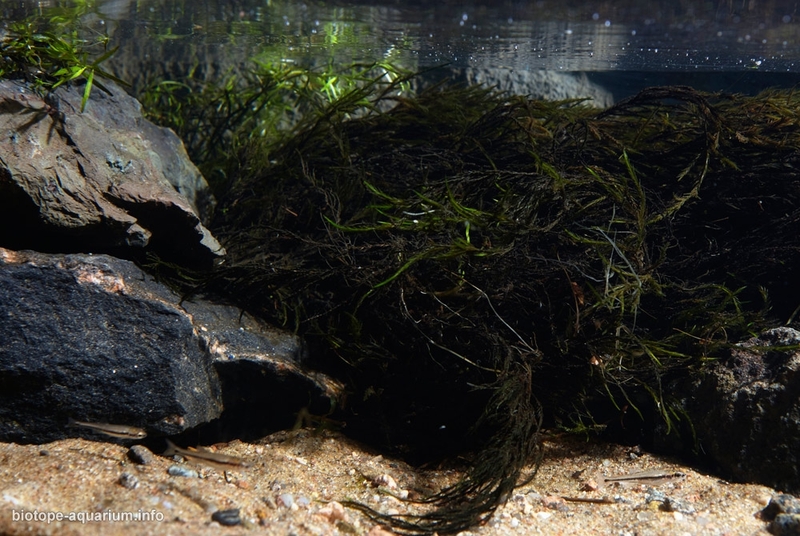 Description of the area surrounding the biotope: Kulismajoki is a small river in the republic of Karelia, in the Pitkyaran region. The source of the river is located in a small lake Kulismajärvi. The length of the river itself is 16 km, then it flows into the small river Syuskyanyoki, which then flows into one of the bays of Ladoga. At the beginning of the river there is a wetland, which gives a brownish hue to the transparent waters. In summer, the amount of water is significantly reduced, its color changes from yellowish to crystal clear. The vegetation near the river is rather specific, as it is surrounded by rocks, many mountainous ferns grow on its banks: Woodsia, Polypodium, Phegopteris, Gymnocarpium, and various types of Dryopteris, rare flowering plants: buckwheat, moss trees, black cohosh, heather, mint and other. The river flows through a rocky area overgrown with a mixed forest. There are trees: fir tree, birch, alder. 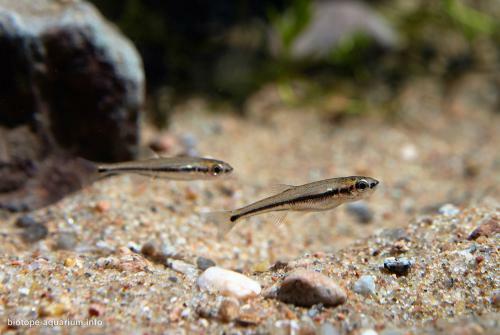 In the river there are fishes: perch, pike, roach, minnows. Jukankoski Falls (White Bridges) is considered to be the highest in the south of Karelia. The nineteen-meter cascade is 8 meters higher than the well-known landmarks of the region, the Kivach waterfall. White bridges are two waterfalls on two branches of the river. When they say “Jukankoski Falls”, they usually mean the right branch, which is much larger than the left one. But the second waterfall, though less high (11 meters), is wide and powerful, but no less beautiful. The waterfall varies with the seasons. In the spring, a turbulent full-flowing river with peat mixtures tints the water yellow. The falls wildly brings down massive water flows from its entire height into the foaming cauldron at its foot. In the summer, the amount of water is significantly reduced, and its color changes from yellow to crystal clear. In autumn, Jukankoski is gaining strength again, water flows become more powerful, but not the same as in spring and only until the first frost. With the cold weather, the waterfall is covered with thin ice, and with the arrival of severe frosts it becomes covered in icy rushes. Despite this, water continues flowing under the ice. 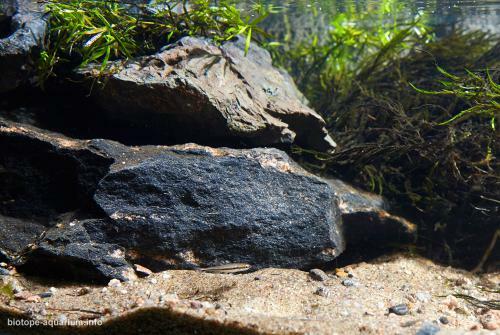 Description of the underwater landscape of the biotope: At the bottom of the stream there are quite a few stones of grayish black color, between which light beige sand is visible. Leaves and branches are taken by a fast current, so the bottom is rather clean. In shallow water, under a waterfall, flocks of young fish, for example, minnows, like gathering. In some places under the water there is Callitriche palustris and clumps of Fontinalis antipyretica. 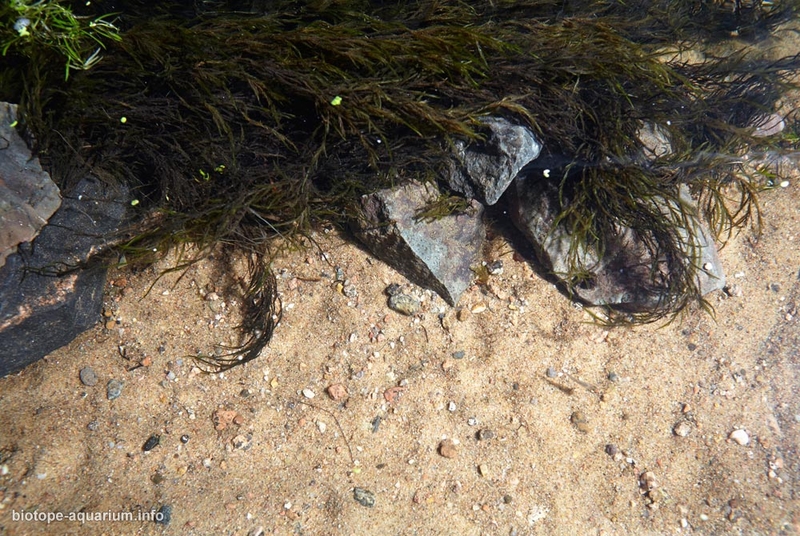 Also, on the stones of the reservoir, there are Andreaeaceae and Bryidae: Rhizomnium, Brachythecium and Amblystegium. 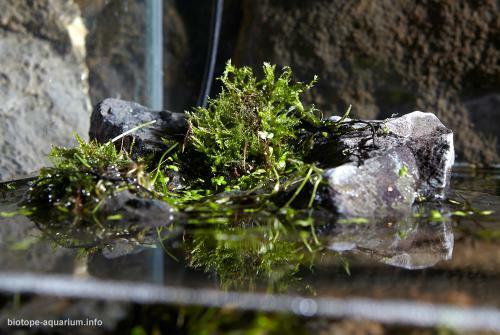 Description of the parameters of the habitat: The water is clear, the color varies depending on the season. Summer temperature is 16-22°C, pH is about 6, KH is 2. List of fishes and invertebrates occurring in the nature biotope: Perca fluviatilis, Rutilus rutilus, Esox lucius, Phoxinus phoxinus. List of plants found in the nature biotope: Callitriche palustris, Fontinalis sp., Rhizomnium punctatum, Brachythecium salebrosum. Threats to the ecology: For several years, the Ladoga-Trophy competition was held in this region (on off-road and quad bikes), but, fortunately, the traces, though left, did not cause irreparable damage to nature. In 1999, the territory received the status of a natural monument.